The Jointed Pelham from Lorina has a single jointed mouthpiece, which employs the nutcracker effect as well as shooting out against the roof of the horse's mouth; this makes the Jointed Pelham a good choice for horses with a tendency to drop their heads. 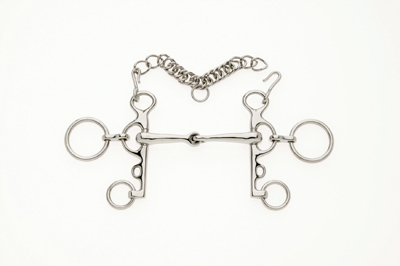 The Rugby Bit design gives the appearance of a Double Bridle Bit, whilst only using one mouthpiece; suitable for showing horses who dislike or cannot accommodate the double mouthpiece. There are currently no questions for Lorina Jointed Rugby Pelham - be the first to ask one!